Begin early. It is always a good idea to do spring cleaning, even if it isn’t spring. It’s never too early to sort, organize and clean out areas that may hold clutter. If you think downsizing your home is in your future, take time to go through your drawers, under cabinets, and closets to begin sorting items you no longer need. Make a Plan. If you are downsizing to move into a smaller home, try to see how much square footage you will have in each room to help plan how much furniture,and storage space you will have for personal belongings. Create a list. Make a list of all the tasks you need to do to downsize; i.e., keep, sell, and donate items you no longer need. If you are moving, make another list with certain priorities at the top of the list that are the most critical that will make an easier transition; i.e. sell home, turn off utilities, transfer mail to new address, change bank and account information to new address. Ask for help. Many family members are willing to help if you ask, ask close friends or if you need help from a professional organizer. Look up a professional with great references that can help make the transition easier since downsizing AND moving is not an easy process especially by yourself or if you are a caregiver to your loved one. Check items off the list. Closing accounts and switching information is usually pretty painless, when deciding on downsizing personal items becomes more difficult and sometimes can be very emotional. What to keep, what to get rid of and/or donate, and what to pass on to family members or friends can be extremely challenging for the loved one and the caregiving trying to help. Everyone forms some form of attachment to certain personal items that evoke positive and sometimes negative memories. As we age, we look back on these memory belongings to reminisce and deciding what to do with these items can be bittersweet but sometimes it can be closure that you are closing a part of a chapter in your book, but remember, your story isn’t over. With a positive attitude, downsizing can be freeing so you can focus on hobbies or spending more time with family without all the extra items to take care of. Give things away. Not everything can come with you, and that’s okay! Keep 1 or 2 boxes of the most special items to you and provide other items to friends or family, so you feel you will still know your items will mean something even if they are no longer in your position but you can still have the memory of them when visiting family or friends. Many times, family or friends are happy to help pack and move, and even take some of your belongings into their own homes. As they help pack, designate items to them or let them choose items they may need or want in their homes. Save memories. You might not have room or space for many items to keep, especially if you have old family albums, or scrapbooks with memories. Check with a family member if they know how to scan pictures into an online photo album. Many times, you can add these images to digital photo frames so you can see old photos pop up that you may not see regularly since they are held on a shelf. You can always keep the most important photos in smaller books so you can view them anytime you want. Use what you can. Use perishable items and paper products because then you don’t have to take it with you. Don’t worry though if you can’t use everything and can’t bring it with you. You will most likely be able to find the same products or similar items at your new location. Clean as you finish a room. As you are done packing one room, move boxes and items out and clean the windows, vacuum, dust or mop floors after completing one room. This will help provide you a break from packing, and then you can close the door to know you are done with that space. Remember it is easier to clean and organize from the top down. Then you know how many areas are left then packing the entire house and then cleaning the entire house. It will help to minimize stress of being overwhelmed. Pack a Go-Bag or Box. Pack enough clothes, toiletries, prescriptions, cleaning supplies, kitchen supplies, basic tools, etc. so you’ll have everything you may need ready to go when you move into your new home. If you are moving in with family or a place that will have everything supplied, then that helps reduce the extra stress and makes it easier to move in and begin your next adventure in your new home! This may be an emotional time but it is a new adventure and a next step that can be scary but a part of life for many so you will be happier if you choose to embrace this new change in your life a positive way and look forward to this next chapter in your life. If you missed Part 1, 2, or 3. 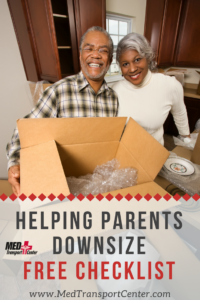 Check out the following links for more information on Helping Parents Downsize.